It’s dark outside, it’s cold and it’s slippery. I'm talking about winter bike rides. I make it a point to ride outdoors at least weekly despite the conditions. On sunny days, the world sparkles outside - even more on a bike. The toughest part is dressing for battle. I keep notes on my phone for temperature ranges and what I need to wear. Typically a poly base, merino wool layer (sometimes 2) and usually a wind shell on the outside. Bottoms are wind front pants - the same ones I use for XC skiing but you can wear castoffs found at Goodwill too. Lobster mitts on my hands and Gore booties over my bike shoes keep me warm down to about 25 degrees. For anything colder I add chemical warmers or limit rides to 90 minutes until a warmup stop. Some folks prefer flat pedals and winter boots. I'll admit that cycling shoes and spd cleats have their limits. I’m a fan of handlebar mitts on my mountain bike. They make it almost pleasant to ride when it’s cold and are an easy DIY project if you have an old jacket you can cut up. Studded tires are great too but roll a little slower. They make a huge difference when it comes to security on ice and rutted pathways. Fat bikes are another option and seem to be really popular in West Michigan. 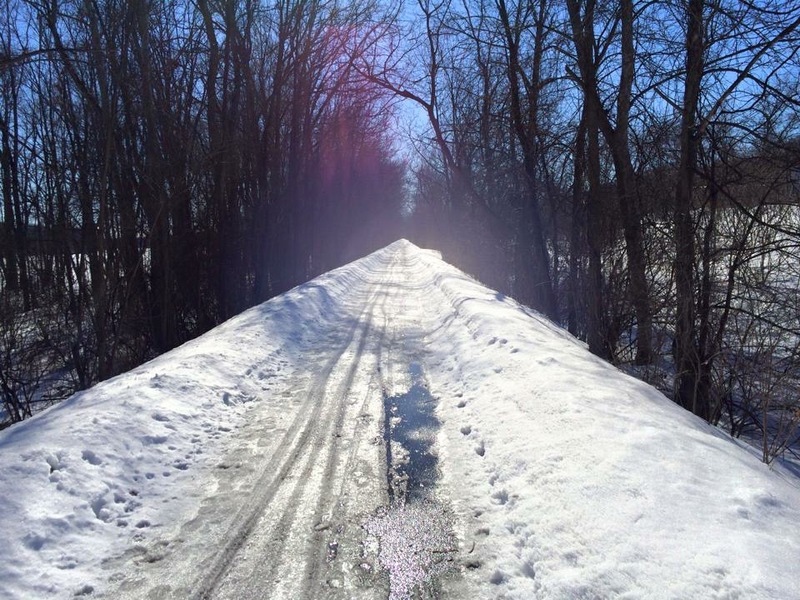 With 1-2” of fresh snow on a path, it’s usually pleasant riding. Anything above that and it becomes work unless the surface is packed. Most of the GR city bike paths get plowed although it takes an extra day or two for clearing. The White Pine Trail is usually plowed from North Park to Russell Road whenever there is more than a few inches of snow. There are great places to warm up and have a sip in Rockford. So get your friends and plan a winter group ride. Winter cycling is fun. Studded tire - Suomi Mount & Ground. The White Pine Trail in January. Welcome to the blog of the Greater Grand Rapids Bicycle Coalition. We’re hoping to post information that’s of interest to the Grand Rapids cycling community here. If you know of something great to share with our community, let us know and we’ll do our best to get it here. We’re here to help make Greater Grand Rapids a better place for bicycles. Our friends, our neighbors and community can all benefit when we work together towards that goal. So please stay tuned and let us know if you see things that might make our community even better for cyclists.